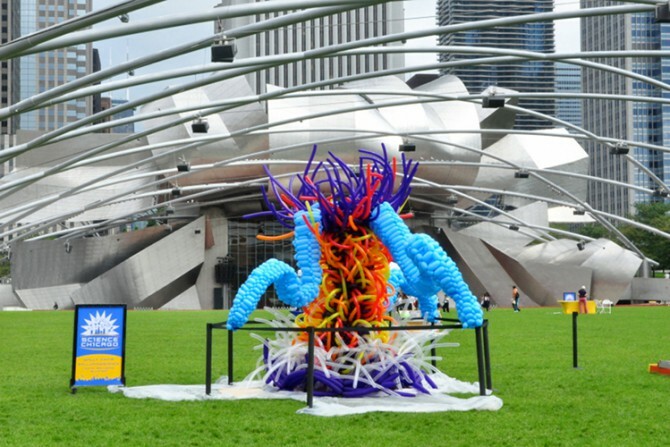 I’ll be exhibiting a balloon sculpture at the National Museum of Mexican Art tonight for a gala/art auction hosted by the Pilsen Together Chamber of Commerce. The event is from 6:30 pm to 9:30 pm and the Museum is located at 1852 W 19th St, Chicago, IL. Free admission. Hope to see you there. LabFest! was a huge success, and the balloon sculptures were a big hit with the crowd on Friday. Thanks to all the amazing volunteers who helped to make the project come together! More photos from the event can be found on the portfolio page. 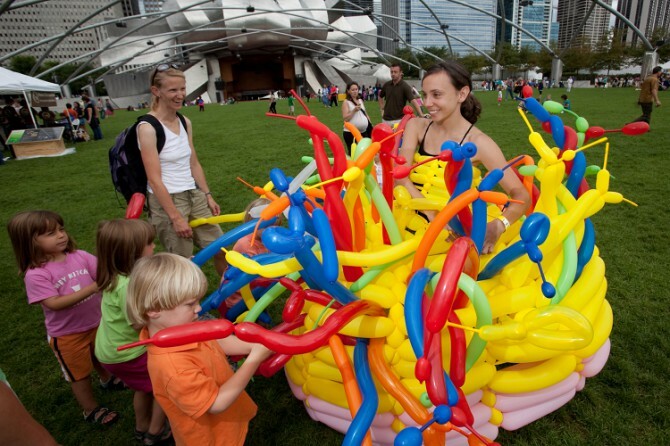 I’ll be exhibiting a giant balloon jellyfish sculpture in Millennium Park tomorrow for the finale LabFest! I’ve been working together all week with an awesome team of volunteers building all the balloon sculptures and organizing the activity we’ve planned for the event participants. 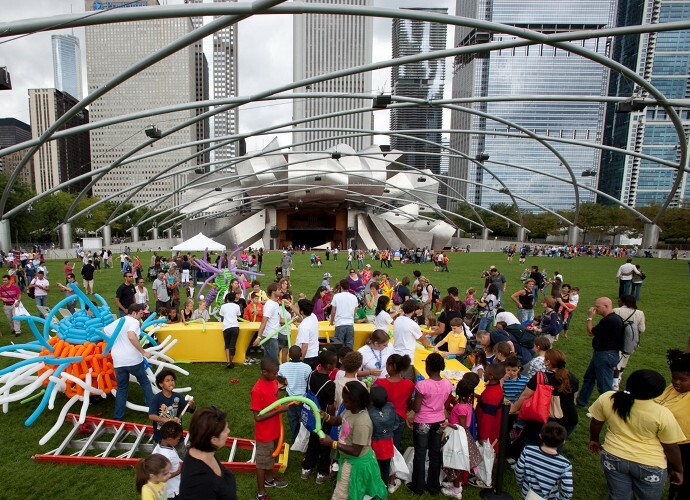 At 6 am tomorrow, we’ll be shipping everything out to Millennium Park in a big truck we’ve rented. LabFest! is from 11 am to 3 pm on the Great Lawn. 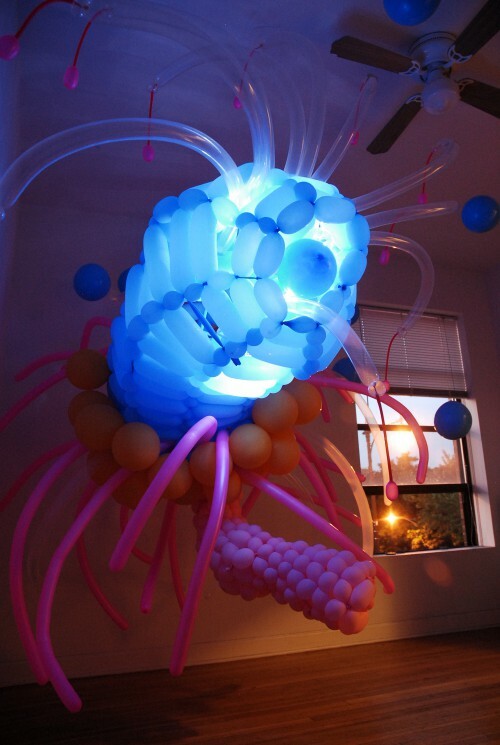 In addition to the giant balloon jellyfish, we’ll have volunteers dressed in balloon jellyfish costumes. It’s going to be awesome and a ton of fun! Come by to check out the festivities! I was featured on WTTW’s Chicago Tonight this evening. Check it out! Studio, Chicago, IL. Built on Wednesday, August 5th. Photograph by Jasmine Kwong. WTTW-Channel 11 came to the studio last Thursday for an interview and to film me making a balloon sculpture. The feature will be aired this coming Tuesday at 7 pm on Chicago Tonight. Be sure to check it out! After 11 hours, I have finally succeeded in integrating a wordpress blog into my website. In case you’re interested in how to do this, here’s a pretty good tutorial to start with.